Trendy infant shoe company Pediped has just expanded their product line to include a rubber-soled shoes for toddlers and preschoolers (aged 2-5). The ultra-stylish and fashion-forward new line designed for active, growing preschoolers and kindergarten-age children is perfect for running, jumping and playing outdoors/indoors. 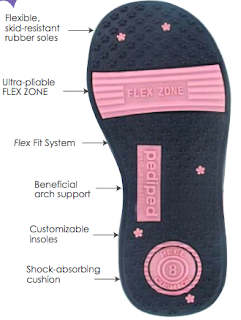 In addition to soft, flexible soles, pediped Flex™ feature supple, premium-grade uppers, shock-absorbing air cushion technology (to protect against impact and distribute pressure throughout the foot), an ultra-flexible pedi flex-zone (to support natural foot motion and provide maximum flexibility) and a built-in arch support (to assist in the healthy development of growing feet). Designed for kids aged 2-5, Pediped Flex is the natural progression from the popular original soft soled line to a more structured shoe for kids on-the-go. They have been officially recognized by the American Podiatric Medical Association as being beneficial for children’s growing feet. For sizing information, colour/pattern choices and prices please visit pedipeds official site. I love Pediped shoes. They really are for kids on the go, my newphew is always on the go and he loves his pair. He whines if I even try to take them off.